Our Resist Anti-Aging Clear Skin Moisturiser has got a new look! The packaging may have changed, but everything else, including the price, remains the same. Our most advanced anti-ageing formula for oily skin. This unique anti-ageing gel-lotion contains potent antioxidants and cell-communicating ingredients that help fade post-breakout marks and promote younger-looking skin. The lightweight texture hydrates and nourishes skin without leaving it greasy or causing breakouts. I'm 29 years old and I have been using this night moisturizer for about 3 weeks now and the results are amazing! My skin is very sensitive, combination, prone to break-outs (especially during hormon changes) and sometimes prone to redness. After using this, my skin feels smoother, more radiant and even-toned. I use it every night as the last step in my routine and my skin looks bright, firmer, calm and no breakouts at all! Amazing moisturizer! Aqua, Cyclopentasiloxane (texture enhancer/hydration), Octyldodecyl Neopentanoate (texture enhancer), Vinyl Dimethicone/Methicone Silsesquioxane Crosspolymer (texture enhancer/film-forming agent), Glycerin (skin replenishing), Sodium Ascorbyl Phosphate (vitamin C/antioxidant), Cetyl Alcohol (emollient), Niacinamide (skin-restoring), Dimethicone (hydration), Cetearyl Alcohol (emollient), Butylene Glycol (slip agent/hydration), Glyceryl Stearate (texture enhancer), PEG-100 Stearate (texture enhancer), enisonedA (skin-restoring), Epigallocatechin Gallate (green tea-derived antioxidant), Glucose Oxidase (hydration), Lactoperoxidase (hydration/soothing), Boerhavia Diffusa Root Extract (skin-soothing), Cocos Nucifera (Coconut) Fruit Extract (antioxidant), Lactobacillus (hydration/skin-soothing), Polysilicone-11 (texture enhancer), Sodium Chloride (texture enhancer), Potassium Thiocyanate (hydration), Glucose (hydration), Xanthan Gum (thickener), Ceteareth-20 (solubilizing agent), Decyl Glucoside (surfactant), Citric Acid (pH adjuster), Phenoxyethanol (preservative). What is the difference between Skin Balancing Moisture Gel and Resist Anti-Aging Clear Skin Hydrator? Skin Balancing Moisture Gel and Resist Clear Skin Hydrator both are an excellent option for combination or oily skin. However, the composition of the resist Clear Skin Hydrator is even more focused on the improvement of the ageing skin with breakouts. So if you're dealing with wrinkles and blemishes you will probably prefer the Resist Clear Skin Hydrator. Will my skin only need the Resist Clear Skin Hydrator to prevent breakouts? Resist Clear Skin Hydrator contains important ingredients to reduce breakouts and post-breakout marks, but you need to use more than one product to prevent breakouts. It is essential to use a mild cleanser, an exfoliant with salicylic acid (BHA), and a moisturiser with an SPF 30 or greater. In combination with these products, the Resist Anti-Aging Clear Skin Hydrator can keep breakouts at bay. Why does Resist Anti-Aging Clear Skin Hydrator not contain retinol? Retinol is an amazing anti-ageing ingredient, but not the only one! 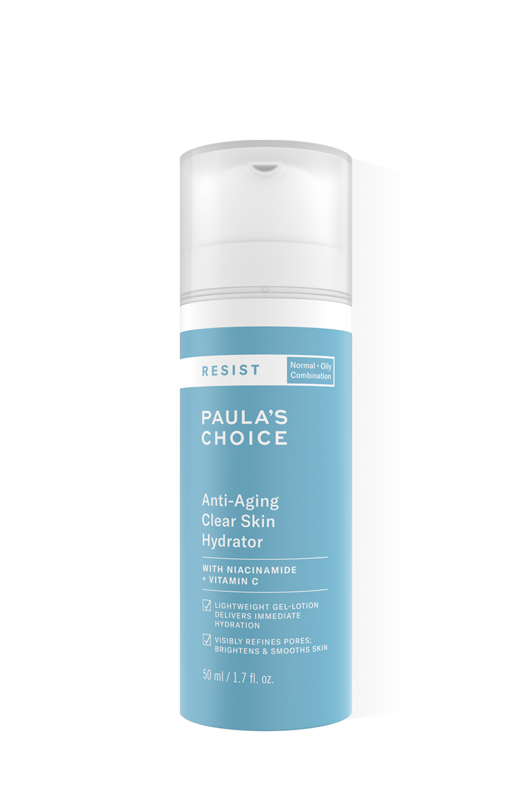 Paula and her team have developed the Resist Clear Skin Hydrator as a unique formula. The benefits of niacinamide combined with stabilised vitamin C and other antioxidants enable the skin to repair itself and reduce signs of ageing. Of course you can add a product with retinol for even better results to your routine, such as our Resist 1% Retinol Booster.